Our skilled craftsmen are experts in working with hand hammered and hand tooled copper. This handcrafted, Western style coffee table features three, horizontal, rectangular drawers, and each drawer is covered with a hand hammered copper panel. Each copper panel is adorned with luxurious, hand tooled copper, floral design. The center drawer is the largest, and each drawer has a hand forged, iron handle in its center. Each lateral side of the coffee table has a rectangular cut design. 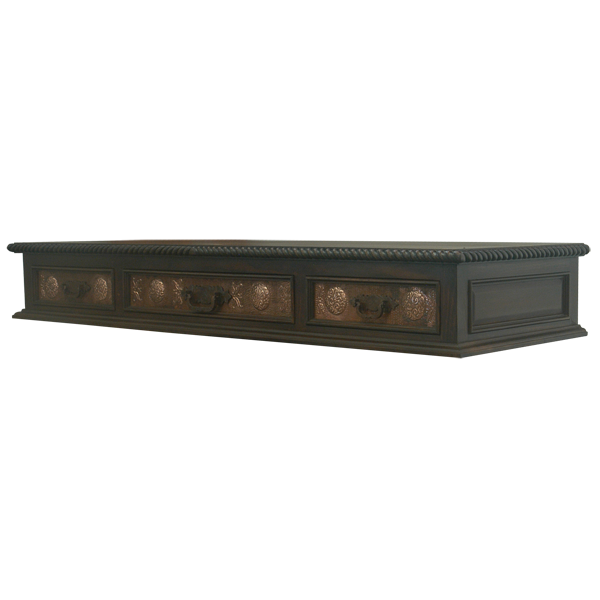 The coffee table rest on a solid wood molding base, and it has an elegant, dark finish. It made with the best, sustainable, solid wood available, and it is 100% customizable.